This is just the latest in a string of Easter Eggs teasing callbacks to elements from that most revered Trek film, 1982’s The Wrath of Khan. In that movie, Spock quoted the “needs of the many” line as he sacrificed himself to save the Enterprise. Last December, one of Into Darkness‘ trailers also showed two hands being pressed against opposite sides of a glass partition, just like that ultimate male weepie momenet at the end of Khan when Kirk says goodbye to his dying friend. 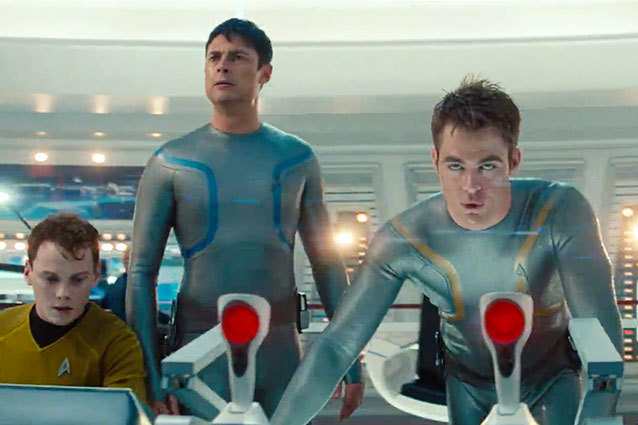 So the message is clear: J.J. Abrams really wants us to think that his movie is a do-over of The Wrath of Khan. Never mind that The Wrath of Khan is perfectly great on its own and doesn’t need a remake. Never mind that Abrams is probably just screwing with us the way he did in saying he wasn’t directing Star Wars Episode VII. Nope, I maintain that John Harrison is really a genetically-modified Klingon who’s infiltrated the deep-undercover Federation black ops agency Section 31. In Hollywood.com’s previous articles on Star Trek, however, commenters have suggested he’s not Khan but a relation of the genetic superman, that he’s a representative of the Terran Empire from the mirror universe, that he’s the god-like Gary Mitchell, that he’s a droid from the same manufacturer of Data, that he’s Q, or that he’s simply just a 24th century time traveler. After all of these fleeting bits of evidence, what do you think? Who Is Attacking the Enterprise in ‘Star Trek Into Darkness’…And Is It a Goner?